The eharmony.com Web site was launched august 2000 by Dr. Neil Clark Warren, a clinical psychologist and one of America's best-known experts on mate selection and healthy relationships. Neil Clark Warren earned a Gold Medallion for America's best book on marriage, Finding the Love of Your Life: Ten Principles for Choosing the Right Marriage Partner, which is now available in 13 languages. His latest book, Love the Life You Live: 3 Secrets to Feeling Good Deep Down in Your Soul with Dr. Les Parrott, was released in September 2003. The eHarmony.com web-based relationship service is unique because participants must qualify for membership via psychological profiling based on the 29 critical dimensions Dr. Warren has identified as key to a successful relationship. Update March 2006: According to eHarmony.com, a new Harris Interactive research study found that between August 2004 and August 2005, 33,000 people who met on eHarmony ended up getting married. Harris conducted a nationwide poll of people who married between September 1, 2004 and August 31, 2005 and this research found that 16,630 marriages resulted from eHarmony matches during this period. The study was conducted by telephone using a representative sample of married Americans. Married respondents were about equally divided between men (47%) and women (53%). The overall margin of error for the current study is +/- 1.4%. On May 17, 2004, eHarmony.com announced that it had been granted U.S. Patent No. 6,735,568 for its unique Compatibility Matching System, a method that uses data from the study of thousands of married couples to predict long-term compatibility between two people. The matching system relied upon by eHarmony is, according to the company, built upon research conducted with more than 5,000 married persons. 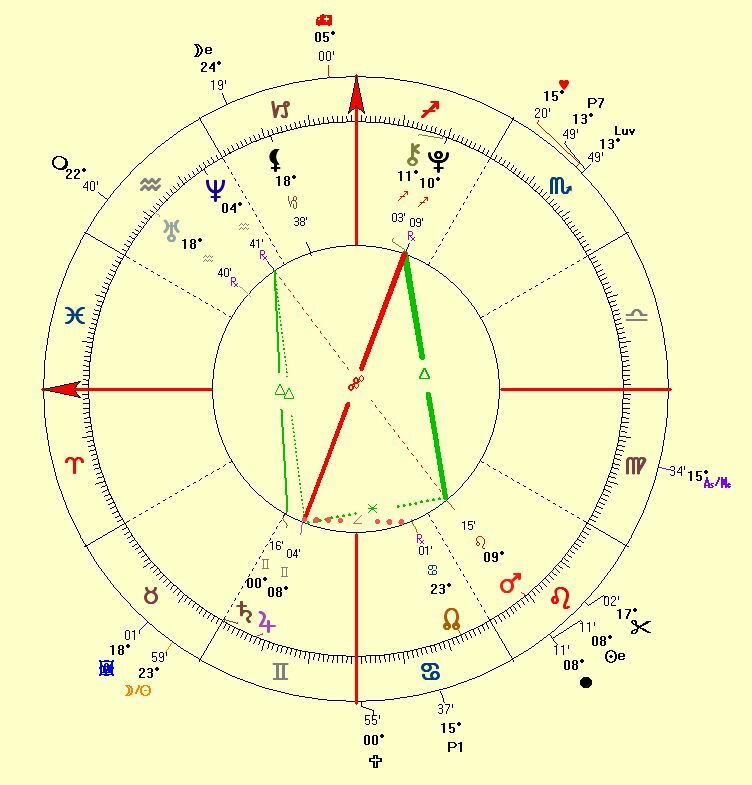 In the corporate chart we find a very powerful trine from Mars to the Pluto/Chiron conjunction. This aspect denotes competitiveness and extraordinary success. There is another important trine from Jupiter to Neptune denoting that religious principles are important. No wonder that the matching of eHarmony.com is based on Christian principles! When we look at these two trines, they form a special configuration that astrologers call a 'mystic rectangle'. Such a chart pattern points to questions that need a solution. The 'mystic rectangle' delivers exceptional skills to overcome obstacles and always brings marked results. This configuration can withstand stress and upsetting events. We consider this a most positive pattern in the business horoscope of a dating service. By the way, it is also said that a 'mystic rectangle' brings or promotes harmony. What a 'coincidence' (?) that the corporation is named eHarmony! eHarmony is one of the only Online Dating Services with such a beautiful configuration. Within 8 years (2008) progressed Saturn will conjunct Jupiter in the natal chart and progressive Pluto will make a sextile to natal Uranus. It is clear that eHarmony.com will grow thanks to vision and sound judgment. New technologies will help too.